Live scoring at an affordable price for your event! Scorebuzzer is a recently developed live scoring product for tennis. Our system is developed based on the future needs of the sport and the users, while providing many benefits to all stakeholders. Starting from a low price of AUD $2 a match, and with a minimum of AUD $100 per tournament, Scorebuzzer makes live scoring very affordable. Our high quality yet cost effective solution for tournaments can add value to the consumers and enhance user experiences in live scoring. All our interfaces are user friendly, flexible and self-operable. We provide different scoring modes, such as ‘chair umpire’, ‘roaming umpire’ and ‘player self-umpire’, along with many scoring formats which cater to any tournament. The recent events we have partnered with, in our short journey, attest to our quality, functionality and customer service. Scorebuzzer.com is based in Melbourne, Australia. An easy to use interface along with professional level scoring functionalities and features is now at your fingertips! Whether it is a chair umpire, a roaming umpire/court supervisor or the player self-umpiring, Scorebuzzer caters to all scoring needs. The app supports multiple scoring formats that enables the system to be used at any level of play. The web based admin dashboard provides referees and tournament directors full control and visibility of the matches. 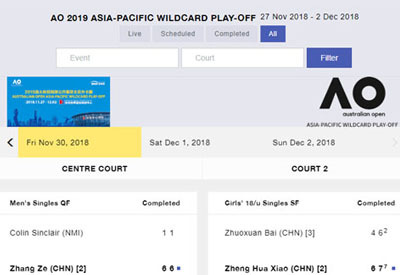 Our user friendly dashboard allows users to easily upload order of play or edit and update match properties. 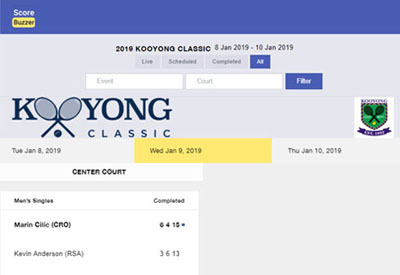 We support order of play templates from many tournament scheduling software, so you can upload the order of play instantly without any changes! Family and friends can follow matches in real time, wherever they are, on any device, a phone, tablet, or on their desktop. You can easily share live scoring with followers. Tournament organisers can display sponsor logos in this page, thereby giving the sponsors a digital reach.